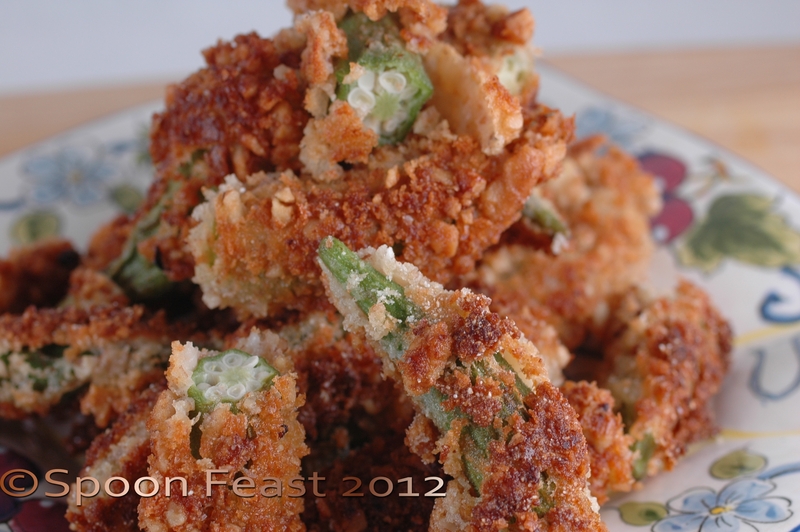 Southern Cooking has to include okra of some kind so I thought Pecan Crusted Fried Okra would be interesting. How many of you like okra? The most common perception of okra is that is disgustingly slimy. I have to give you that it is slimy like a world of snails would love. Then I discovered pickled okra and fell instantly in love. 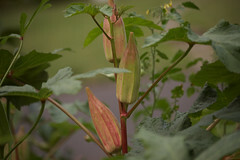 Quickly I learned there are ways of preparing okra that avoid the slimy aspects of this misunderstood vegetable. 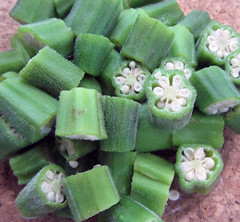 Used in vegetable soup, okra will give the broth a nice thickness, not too thick but not watery either. I love the little balls of seed that float into the soup, yummy. Okra is found all over the world and is used in many cultures and cooked in just about as many different ways as you can find recipes. I am working on developing content for Charlotte Cooks which begins filming the new PBS season in August. We are filming a segment on Southern Cooking and that must include some kind of okra dish. Robert thought it should be fried okra. So as I researched and thought, the idea of combining the southern love of cornbread, buttermilk and pecans with okra. This is the result of my study. Set up a standard breading procedure with trimmed okra, cornbread mix, buttermilk, mix the pecans and panko together in the third pan. Wash and dry the whole okra pods. Trim the tops off the okra, leave the pods whole other than the top. Bread the okra by coating in flour, then buttermilk, then pecan mix. Have a pan with enough oil to come half way up the okra in the pan. Only enough oil to come half way up the okra. Don’t move them around too much. See, even mine had some drop the breading. Keep those as “cooks treats”. Cook on medium high heat about 3 minutes on each side. The breading will be golden brown. Using a slotted spoon or slotted spatula remove the golden brown okra from the hot oil and drain on a fresh paper towel. Season with a light sprinkle of fine salt. Serve with Texas Pete Hot Sauce. Be careful, not only are these lovely morsels tasty and addicting but they will disappear before you know it! 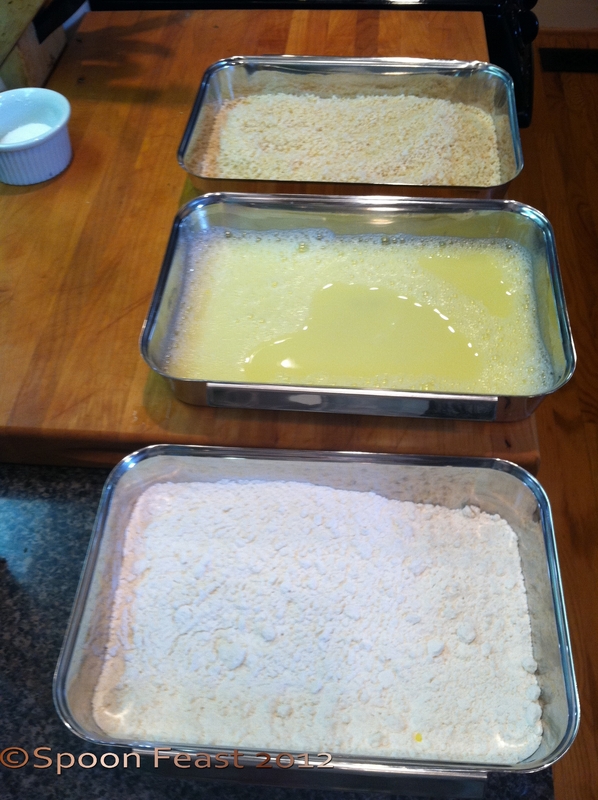 When calculating how much to make, always make more because you will need it. OK, now here’s the thing. Many of you will experience the breading does not really want to stay on the okra. It is hard to bread an okra and have it stay on like it should. Following the standard breading procedure making sure to get each pod coated in flour first then coat totally in the buttermilk then pecans you will have the best chance of keeping the breading intact. Once they hit the pan, let them cook. Don’t move them around too much or you WILL see the breading all fall off. This is why they don’t get deep-fried too. Just enough oil to come about half way up the okra while in the pan. Make sure the oil is hot so the okra start cooking as soon as they hit the pan. 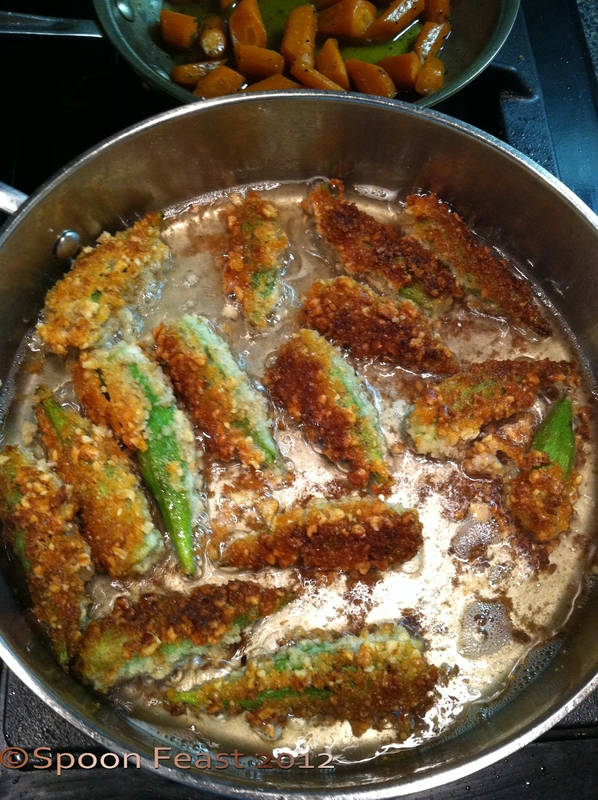 Putting them in a cold pan and cold oil will result in soggy oil filled okra. That is disgusting. Oil and slime. Avoid it. When they are done, pile them up on a plate and serve. Jump back quick because they will disappear before you set the plate down. Ya’ll come and don’t be late for dinner! This entry was posted in Cooking, Recipes, Southern Cooking and tagged cook, cornbread mix, Fruit and Vegetable, Home, martha white, Okra, Olive oil, Pecan, Texas Pete, Vegetable, vegetarian. Bookmark the permalink. I’m not much of an ocra fan but encrusted like this sounds fabulous. I love okra no matter how it is prepared. Pecans added to the breading has to be great.